Technology designed to manipulate the environment. Based on the best selling book, Angels Don’t Play This HAARP, narrator Dr. Nick Begich presents a compelling discussion of one of the important military advances of the United States Government. The technology is designed to manipulate the environment in a number of ways that can jam all global communications, disrupt weather systems, interfere with migration patterns, disrupt human mental processes, negatively affect your health and disrupt the upper atmosphere. 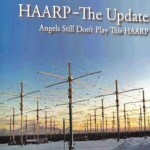 The U. S. military calls this new zapper the High-frequency Active Auroral Research Program or HAARP. Based on the best selling book, Angels Don’t Play This HAARP, narrator Dr. Nick Begich presents a compelling discussion of one of the important military advances of the United States Government. The technology is designed to manipulate the environment in a number of ways that can jam all global communications, disrupt weather systems, interfere with migration patterns, disrupt human mental processes, negatively affect your health and disrupt the upper atmosphere. The U. S. military calls this new zapper the High-frequency Active Auroral Research Program or HAARP. The rest of the story is revealed in the patents, technical papers and other documents that continue to emerge regarding this project. Begich has presented on the subject as an expert witness for the European Parliament, Committee on Foreign Affairs, Security and Defense Policy Subcommittee on Security and Disarmament, GLOBE and others.